If you weren’t there, you missed out on some fun! Highlights from the weekend included our first face-to-face meetings with Dave Scott (AKA Dave From Ohio) who was featured on a past episode of The Paranormal View all about the state’s wide variety of urban legends, James A. Willis (author of Weird Ohio) who was featured in an episode with the same name, and John Kachuba (author of Ghosthunting Ohio and Ghosthunting Illinois) who will be a guest of The Paranormal View in the near future. Last, but certainly not least, we had a great time trading stories and goofing around with Keith Age (Spooked and Children of the Grave). I’m sure we’ll be seeing him again very soon… wink, wink! In this picture (from left to right): John Kachuba, Keith Age, Beth Brown, and Henry Foister. 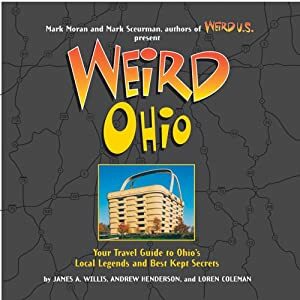 This entry was posted on August 18, 2009 at 3:27 pm and is filed under From the Hosts with tags Dave Scott, Dayton, Folklore, ghosts, James A. Willis, John Kachuba, Keith Age, ohio paranormal convention, Paranormal, Urban legend, Weird Ohio. You can follow any responses to this entry through the RSS 2.0 feed. You can leave a response, or trackback from your own site. It was nice to finally meet you two. I hope the conference was a success for you. I was hoping more people would have attended, since so many people in this area are interested in paranormal things, but this was the first year for Ohio Paracon – maybe it will be packed next year. I did have a lot of fun talking to everybody. I didn’t know Keith Age was a bass player. I’ve played bass since I was 14 years old so I’m sure we could have talked for ages about bass guitars. HAHA Dave. I am glad you had fun. We are already gearing up for next years and making sure to spread the word early. The first year for the event was more successful than we thought and we hope more will attend in 2010 :). Nice post, amazing looking weblog, added it to my favs. keep a reader amused. Between your wit and your videos, I was alkost moved to start my own blog (well, almost…HaHa!) Wonderful job. You’re so cool! I do not suppose I’ve read something like this before. So wonderful to discover somebody with skme unique thoughts on this subject matter. Really.. thanks for starting thus up. This web site is one thing tha is required on the web, someone with a bitt oof originality!